Kagamine Rin is a Japanese VOCALOID developed and distributed by Crypton Future Media, Inc., and was released for the VOCALOID2 engine. She is voiced by seiyuu, Shimoda Asami. Her appearance was illustrated by KEI. She has blonde hair done in a short hair style and blue eyes. She wears a sailor collar shirt with treble clef print. She wears shorts along with detached sleeves, leg warmers and a white headset and large hair bow. Her twin/alternate self is Kagamine Len. The following tags are aliased to this tag: /kr (learn more). 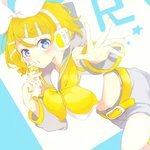 The following tags implicate this tag: kagamine_rin_(roshin_yuukai), kagamine_rin_(append) (learn more).